Helen Margaret Waaka, will be talking about ‘Waitapu’ at a regional meeting of the Hawkes Bay branch of the NZNO ( New Zealand Nurse’s Organisation ) on March 21st at 6pm, at the Hastings hospital. The NZNO are wanting to promote the diversity of nurses and prove they are not only defined by their nursing roles. The talk will focus on Helen’s journey to becoming a published author and the origins of her short story collection, ‘Waitapu’. The following month she will be talking to the Central Hawkes Bay branch of Business and Professional Women at their monthly meeting on April 21st in Waipukurau. Read the latest reviews for ‘Waitapu’ here. Over the summer break our readers from Escalator Press have been considering manuscripts for the coming year. A group of seven readers selected two outstanding manuscripts from a pre-selected pool of four, one a non-fiction memoir about a child growing up with acute arthritis, and the other a Young Adult novel that centres on surveillance as its major theme. We’re very excited about these manuscripts, both of which are debut works from ex-students with strong original voices and important things to say. Our hearty congratulations go out to Trish Harris and Logan Smith, who we are very pleased will be adding their weight to Escalator’s growing selection of excellent New Zealand books. Exciting news for Waitapu! Not only d id it reach Number 3 on the Nielsen Bestseller List the week of its CHB launch but it has also been mentioned twice in the Booknotes Unbound Favourite Books of 2015. 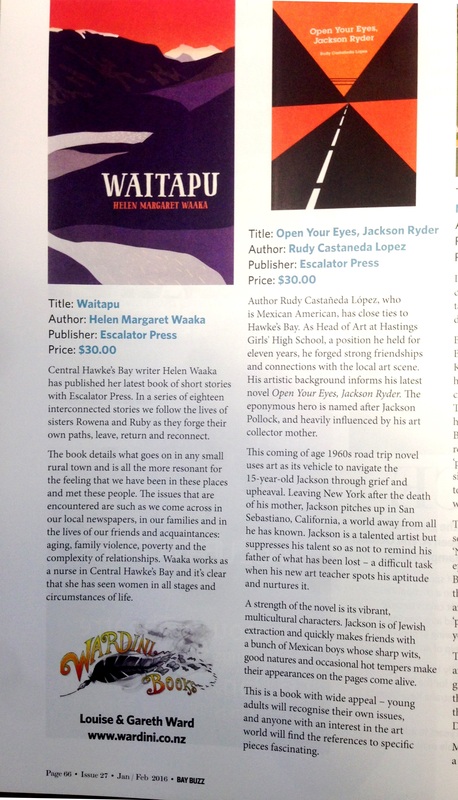 Albert Wendt and Paora Tibble included Waitapu in their three best reads of the year. Albert says Waitapu is unpretentious, sensitive and accessible…it will live with me for a long time’. 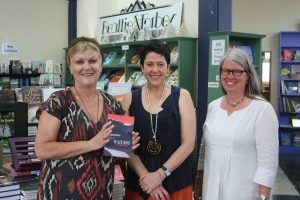 Helen has recently visited Beattie and Forbes bookshop at Ahuriri in Napier, and the Dannevirke and Wairoa libraries to talk about her book. The fabulous Wardini Books in Havelock North hosted an event to give Open Your Eyes Jackson Ryder a Hawke’s Bay launch at the end of November. Book lovers also had a chance to hear Janet Colson read from The Shark Party and talk with Rudy about the art in their writing as part of the authors’ November book tour. While they were there Maria Williams talked to Janet and Rudy for TVHB’s Chatroom programme (Freeview HD 48). Both interviews will be aired in the week of 14 December. Tune in if you’re in the region. 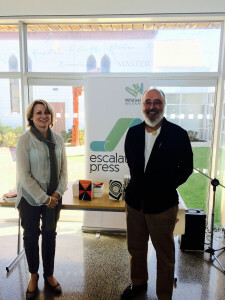 Escalator Press has organised 14 events in the last few weeks: In Havelock North, Waipukurau, Waipawa, Hastings, Masterton, Waikanae, Paraparaumu, Porirua and Wellington. Many of these were in conjunction with bookshops: Paper Plus in Waipawa, Masterton, Paraparaumu (Coastlands) and Porirua; Wardini Books in Havelock North; and Marsden Books in Karori. It’s been great to have the opportunity to work with so many bookshops, and plans for 2016 will see this continue. There was some good news this week for relatives of Assyrians caught up in the war in Syria, with 37 Assyrian hostages released by Islamic State (IS). The hostages, all elderly, and 27 of whom were women, were captured back in February in Assyrian villages overrun by IS on the Khabur river, in Hasaka province. Some 3000 villagers fled at the time. Unfortunately, 168 Assyrians from the Khabur area are still being held hostage. The plight of Assyrians in Iraq during the 1990s is depicted in Kate Carty’s novel Run Thomas Run. Staff at Paperplus in Masterton dressed as characters from their favourite books to celebrate NZ Bookshop day on Saturday 31st October, which is of course Hallowe’en so there’s already a dress-up theme. Janet Colson and Rudy Castanda Lopez (dressed as themselves) hit the town to drop in on Hedley’s and Paperplus, both enthusiastic stockists of Escalator Press titles. 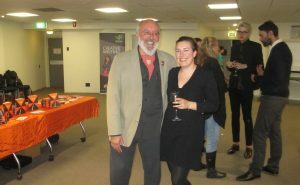 The two authors went on to give a talk about art and their novels at the Aratoi Museum of Art and History hosted by Director Alice Hutchison. The duo carry on the conversation at the Mahara Gallery in Waikenae on Saturday 7th November and at Wardini Book on 28th. 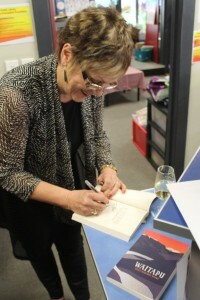 Author of Waitapu Helen Waaka, signing books at her Waipawa launch. Helen Waaka’s short story collection, Waitapu was launched at the Waipawa town library on October 15th and at Wellington Central Library on October 21st. Both events were well-organised and well-attended with books selling out in Waipawa. In Wellington Renee talked about Waitapu sneaking up on the reader, tapping them on the shoulder and taking them to the difficult, the joyful, the painful and the pleasurable. “It’s like we’ve always known these people. We live among them. We recognise them because they are survivors too… someone has finally got what small towns in Aoteaora are all about.” Prior to the Wellington launch Helen was interviewed by Lynne Freeman at Radio NZ. Listen to “Standing Room Only” here. Rudy also featured in this week’s Independent Herald Newspaper in an outstanding Q&A article written by Sharnahea Wilson.